Steven Spielberg announced he is remaking the 1961 classic “West Side Story,” and he is promising Hollywood leftists that it will be a politically correct remake to trash President Donald Trump’s stance on illegal immigration and to bash the Southern border wall as inhumane. 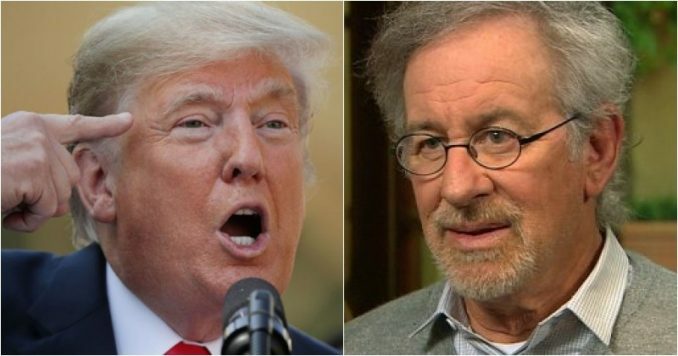 Spielberg is changing the lyrics to the song “America” to reflect his new anti-Trump theme. Well, Spielberg just got a nasty surprise that really throws a wrench in his new anti-Trump film. You’ll love this. There are movies that should never be remade, and West Side Story is one of them. The Oscar-winning classic starring Natalie Wood and Rita Moreno depicts a modern Romeo & Juliet story between a young Puerto Rican girl and an American boy who are kept apart by two rival gangs. And it’s a pro-American film set in 1950’s New York. In the movie, the Puerto Rican gang (the Sharks) lament how they are treated by the American gang (the Jets), yet, they celebrate just how lucky they are to be in America as immigrants. And that pro-American theme comes out in the song America, which Spielberg is vowing to change the lyrics to reflect his rabid hatred for President Trump’s stance on immigration. According to The Hollywood Reporter, Spielberg, along with screenwriter Tony Kushner and other members of the West Side Story creative team, made a secret visit to San Juan, Puerto Rico last month where they met with as many as 60 invitees to discuss ways to avoid portraying Puerto Ricans in the same stereotypical light as the original. “THR reports that the meeting between Spielberg and the invitees went smoothly overall until one theater history major, Isel Rodriguez, asked the West Side Story creative team exactly how they plan to represent Puerto Ricans in the film,” the Daily Wire reported. “Let it sink back in the ocean” refers to a line in the song America, in which the character Anita (Rita Moreno) sings about her love for America while trashing her homeland. “Puerto Rico / My heart’s devotion / Let it sink back in the ocean,” goes the lyric. And to be clear, the song also features Anita’s boyfriend bashing America for its racist tendencies in the 1950’s. “Life is all right in America/If you’re all white in America,” he sings. So it’s not something Spielberg needs to change to make his point. The Hollywood leftist just wants to make the entire song and movie anti-American. That’s why the billionaire director had to bring President Trump into the mix. “In his final remarks to the university group, Spielberg attempted one last tack, positioning the film as a response to the hard-line anti-immigration stance taken by Donald Trump,” THR reported. Why do these Hollywood leftists always have to take something that has nothing to do with politics and make it into a leftist propaganda hit piece? Well, poor Spielberg just pissed off 63 million Americans who won’t be paying to see his remake of West Side Story. “Really being anti-Trump is part of the notifications. Won’t be seeing the remade West Side Story. The original can’t be beat,” tweeted Paige Carney. And one American immigrant who claims to have been in a West Side Story stage production is deeply offended Spielberg is bashing legal immigrants. By that rationale, countless "classics" films would need to be remade and/or by not much extension of political correctness even banned because they may involve cultural "appropriation". e.g. South Pacific? Never mind Marx Bros. Opera even more so, e.g. Madame Butterfly, Aida? Steven Spielberg is taking a masterpiece of American culture, and he is intending on ruining it. You don’t remake a Picasso or a painting done by Leonardo Da Vinci. West Side Story reflects 1950’s Americans in New York City, and his big problem with it is it’s not anti-American enough? Someone should tell the leftist director to just save his time and money. Americans love their country, and part of our culture is great films which should never be remade to score political points. West Side Story won 10 Academy Awards, and he is so arrogant he thinks he can do better? Well, at least Nancy Pelosi and her Democratic cohorts will be happy. Spielberg hasn’t filmed one scene of this remake, and already it’s a flop.